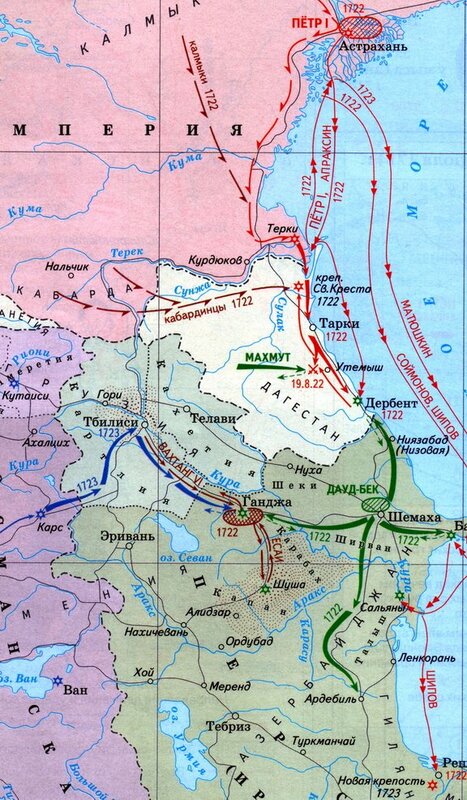 In 1722, Peter the Great led a Russian military campaign southwards along the western shores of the Caspian Sea through Dagestan and Azerbaijan towards Persia. This was the start of the short-lived Russo-Persian war (1722-23) that ended with Russian territorial gains in the Caucasus and heightened Russian-Ottoman tensions. Along on the journey with Peter the Great’s army was Dimitrie Cantemir, a polymath scholar, historian and twice prince of Moldavia. While on the campaign route along the Caspian path, Cantemir wrote notes about the archaeological ruins he encountered, particularly hilltop fortifications and wall segments. Although he died at the end of the campaign, his papers were passed on to an academician at the newly-created St. Petersburg Academy of Sciences, a German named Gottleib Siegfried Bayer. 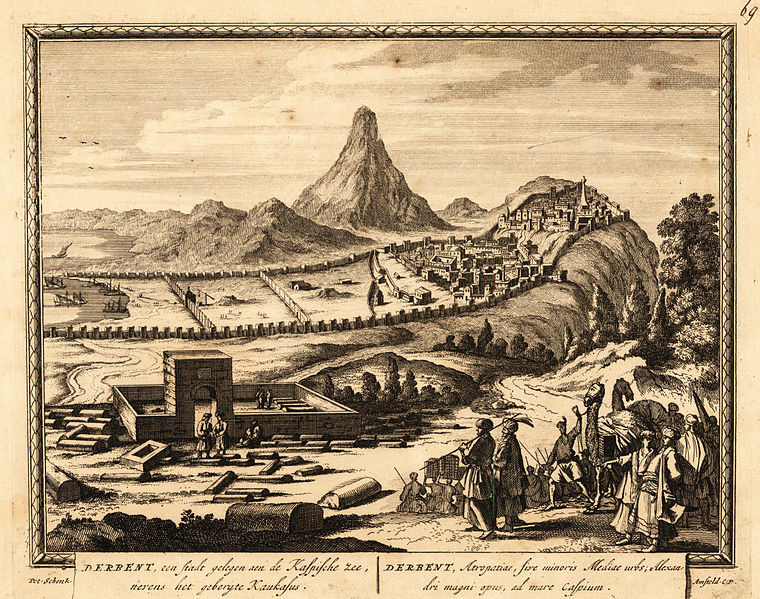 In the very first volume of the academic journal of the St. Petersburg Academy of Sciences, or Commentarii Academiae Scientiarum Imperialis Petropolitanae (1727), Bayer published an article based on Cantemir’s notes titled “De Muro Caucaseo” (About the Caucasian Wall). In this, he writes about the Russian encounter the Caucasian peaks near Derbent, fortified by “muro… vasta longitudine porrecto inter Caspium mare et Pontum” (a wall… of great length running between the Caspian and Pontic seas). A part of the wall, which had been thrust up into view, stirred conjecture about all the rest of the mass– how large and how wonderful it had been, particularly in this wilderness, upon these mountain peaks, and especially because the stories of men as well as the color itself of the stone attested to the great old age, so marked by human craftsmanship, of the work. With the help of Cantemir’s notes and sketches, as well as a wide array of Latin, Arabic and Persian literary sources, Bayer speculated that the remains of the wall seen by the Russian forces dates to the time of the Median empire, and were part of a wider fortification system. While it seems impossible to identify the precise archaeological remains noted by Bayer, there has been modern archeological work on fortifications in the area of Derbent, which dates the standing remains to the Sasanian period (Gadjiev 2008). It is likely that the wall fragment seen by Cantemir and Peter the Great was also Sasanian. What interests me in this episode is not, however, the accuracy of Bayer’s conclusions. Instead, it is the situations that brought armies, travelers, and really big walls to the Caspian shores. Archaeological investigations have long been entangled with military campaigns, dating back at least to the 18th century across Europe. On a practical level, the consequences of this history can be profoundly helpful for archaeologists. 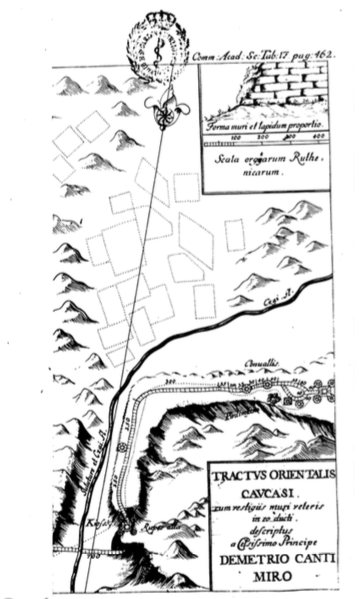 Topographical records of early military draughtsmen, for example, often preserve records of landscapes much changed in the intervening centuries. Written accounts of travelers, meanwhile, provide additional information about monuments now lost, or local place names now changed. But the entwined histories have theoretical consequences for the discipline of archaeology as well. The imaginations of imperial militaries– and the aspirations of their potentates– provided a theoretical framework through which to interpret antiquity. In the case of Cantemir and the Caucasian fortifications, the parallels and reverberations are clear. This location, of profound strategic importance for the Russian empire, was studied in the context of the longue durée of its strategic significance. Archaeology is not today, and never has been, just about the past.